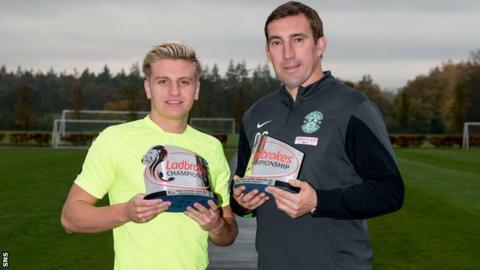 Hibernian pair Alan Stubbs and Jason Cummings are the Ladbrokes Championship manager and player of the month for October. The Easter Road side are unbeaten in 12 games, winning 11 of those. Striker Cummings, 20, has scored 12 goals this season, finding the net in all four league wins last month and in the two subsequent matches. Stubbs, 44, is in his first management job, having taken over after the club's relegation in 2014. Hibs, who are five points behind Championship leaders Rangers, have taken Premiership scalps Aberdeen and Dundee United on the way to the last four in the League Cup. "There's a confidence about us," explained Stubbs after Wednesday's 3-0 home success against United. "When you've gone 12 games undefeated if you don't have a swagger you'll never have one." Meanwhile, Cummings has told BBC Scotland he thought his chances of a professional career were over when he was released by Hibs' Edinburgh rivals Hearts. The forward spent five years at Tynecastle in their youth set up before being told as a teenager he was being let go. "I thought that was me." Cummings said. "I had to get a job and was a gardener for over a year. I did enjoy that but my dream was to play football. I went back to my roots at a boys club and started enjoying it. "I got picked up at Hearts and was there for a good five years. I did pick up a couple of injuries so I was sidelined for a bit but I got back fit. Basically they didn't take a risk on me and didn't fancy me. "They released me when I was about 16 or 17. It did kill me at the time. I was depressed, I was raging but I did find my love for football again when I went back to Hutchison Vale. I started enjoying it again, scoring a lot of goals and that is when Hibs came in and picked me up from the boys club." Stubbs says Cummings "is maturing week by week". "I think that is probably been the catalyst for him to be in the form he is in at the moment," added the head coach. "He has had problems that young players can have but we have tried to help and guide him on and off the pitch." Cummings' form has attracted the attention of scouts from England and beyond but he insists all he is looking at for the moment is playing for Hibernian and trying to help the club gain promotion to the Premiership. "It is a massive compliment," the striker said of being linked with other clubs. "It makes me more confident and want to play better and better and I am just enjoying my football at the moment."